…the best technology for reducing atmospheric CO2 was invented long ago. Trees, grasses, marine and terrestrial plants sequester atmospheric CO2 very effectively using methods perfected over millions of years. All we need to do to use this wonderfully evolved process is to keep or, even better, increase our forest cover. 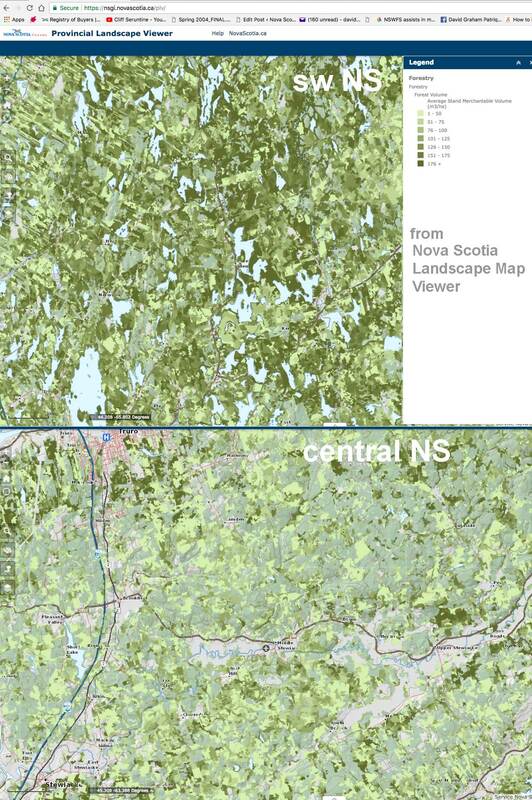 For most of central and eastern Nova Scotia we need to let those vast swaths of clearcut forests regrow and keep growing (taking up carbon dioxide as they do) until they reach volumes of at least 20 cords/acre (approx. 180 cubic meters per hectare), then harvest selectively. That likely means no cap-and-trade benefits until we reach at least 20 cords/acre, a price paid (and not the only one) for past excesses. The carbon book-keeping tells us we can thin the young forests to increase growth and use the thinnings as we might wish to heat our homes ( not for electricity), but clearcutting our forests for bioenergy will increase our output of carbon dioxide, not reduce it. It’s not complicated folks but we do need to do the proper accounting. The world is going to demand it. This entry was posted in Biomass, clearcuts, Climate Change, Letters&Editorials. Bookmark the permalink.